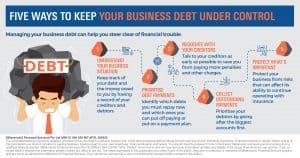 Piling up a lot of debt could leave your business in financial difficulty or, worse, bankrupt. Here are five ways that may help you manage debt and avoid a financial mess. Disclaimer: The views expressed in this publication are solely those of the author; they are not reflective or indicative of Millennium3 Financial Services position and are not to be attributed to Millennium3 Financial Services. They cannot be reproduced in any form without the express written consent of the author. The information provided in this document, including any tax information, is general information only and does not constitute personal advice. It has been prepared without taking into account any of your individual objectives, financial situation or needs. Before acting on this information you should consider its appropriateness, having regard to your own objectives, financial situation and needs. You should read the relevant Product Disclosure Statements and seek personal advice from a qualified financial adviser. From time to time we may send you informative updates and details of the range of services we can provide. If you no longer want to receive this information please contact our office to opt out.